Find tips, rhymes and lots more activities. Note: Some of the letters are written differently in Little Wipe-Clean First Words. Children can use their fingers on phones and tablets to write letters and words and draw pictures. 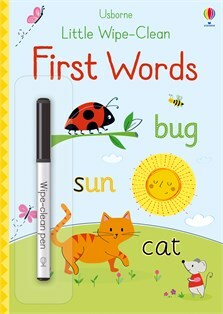 This fun book is a perfect way for young children to learn their first words. There are lots of easy three-letter words to practise reading and writing and a guide to writing big letters too. With durable, wipe-clean pages for endless practice and links to websites with advice and more activities to help children learn to read and write.